Monday August 12th 1889 We started about eight oclock and drove over to George Billingsleys where we stayed till after dinner and had a pleasant visit indeed. We came back home another road and the drive was splendid. Were home in time for supper. Will went to town in the evening. Robbie is here with Edith. I talked with the folks all evening. 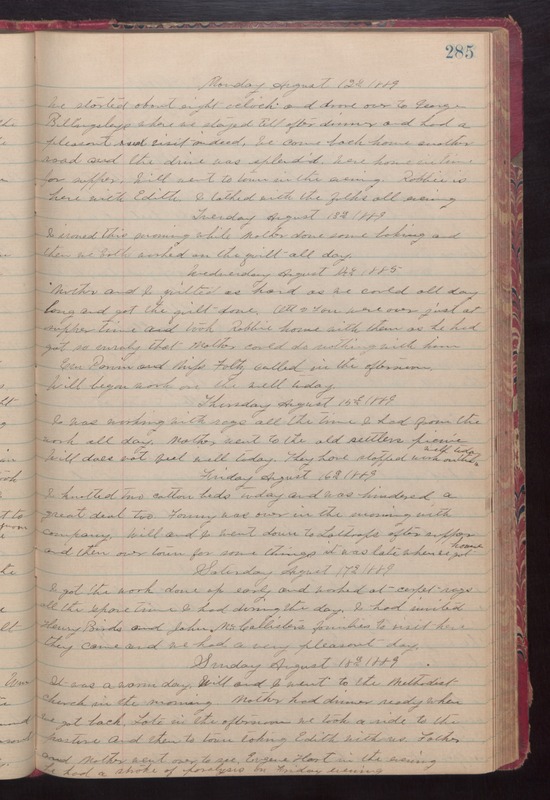 Tuesday August 13th 1889 I ironed this morning while Mother done some baking and then we both worked on the quilt all day. Wednesday August 14th 1889 Mother and I quilted as hard as we could all day long and got the quilt done. Ott and Fan were over just at supper time and took Robbie home with then as he had got so suraly that Mother could do nothing with him. [Ern?] [Parvin?] and Miss Folty called in the afternoon. Will began work on the well today. Thursday August 15th 1889 I was working with rugs all the time I had from the work all day. Mother went to the old settlers picnic. Will does not feel well today. They have stopped work on the well today. Friday August 16th 1889 I knitted two cotton beds today and was hindred a great deal too. Fanny was over in the morning with company. Will and I went down to Lathrops after supper and then over town for some things it was late when we got home. Saturday August 17th 1889 I got the work done up early and worked at carpet rugs all the spare time I had during the day. I had invited Henry Birds and John McCallisters familiers to visit here. They came and we had a very pleasant day. Sunday August 18th 1889 It was a warm day. Will and I went to the Methodist church in the morning. Mother had dinner ready when we got back. Late in the afternoon we took a ride to the pasture and then to town taking Edith with us. Father and Mother went over to see Eugene Hart in the evening. He had a stroke of paralysis on Friday evening.